LOTS OF UPGRADES HERE, New roof and skylites 2017, New range, HW heater and Heat/AC in 2019, Newer pool pump, Rainbird Control and garage door opener. 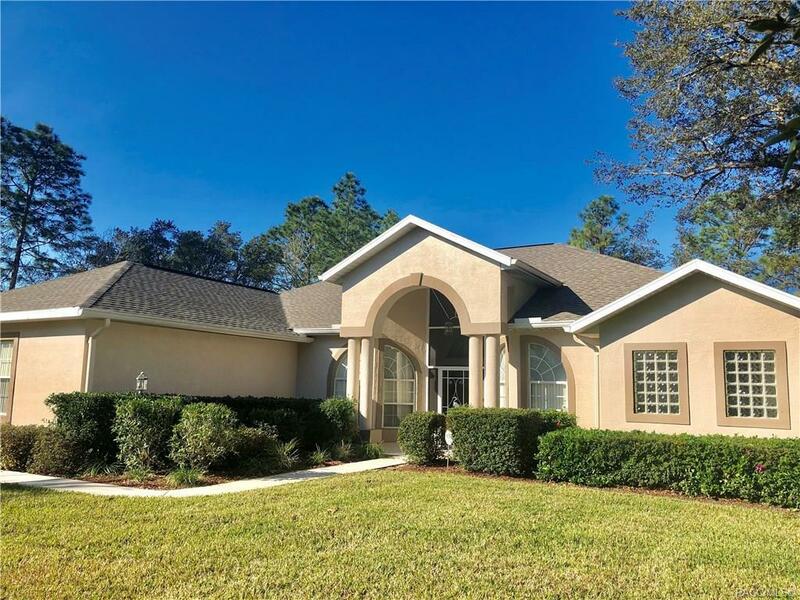 Kitchen has wood cabinets with roll out shelves, double cabinet pantry, pantry, Beautiful built in Hutch, Corian counters, stainless steel appliances. Updated light fixtures. Front porch has screened entry. Attached garage has lots of cabinets, tile and painted floor. Master bath has Jacuzzi tub plus walk-in shower, huge linen closet, 2 large vanities. Detached 2 car GARAGE w/overhead door and opener, attached 4 STALL CARPORT and there is plenty of room for boat or RV parking. Fenced area for pets off lanai. CuldeSac street. Directions: From Lecanto Hwy, West On Mustang, Right On Canarywood, Right On Allamandra, Right On Capa To Home On The Right.